I know a lot of you do some great jobs of decorating your homes for the fall season. I wish I was one of them. :) My husband and I are retired and we now live in a smaller house (less to clean...more time to play!) so I don't have much room to do a lot of decorating. Now on the other hand....my daughter does a lot of decorating! 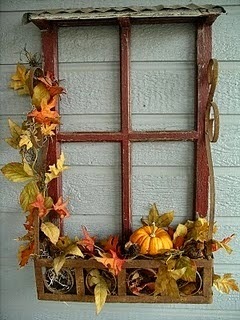 I am sharing this article with all of you that want a few ideas on your decorating for fall. Now that the air is getting crisper, the sun is setting sooner and the leaves are turning those wonderful colors of yellow, orange and red; it is time to decorate for fall! 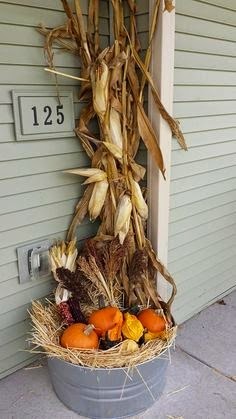 Fall decorating does not have to be expensive. You can collect items right from your own backyard. Some of the items, such as corn stalks and Indian corn can be purchased at a nearby farmer’s market. Colored leaves and pine cones always add color to your home. I love the old frame that is used for this that you can get from your local thrift shop. Acorns, twigs and branches bring the outside in your home. 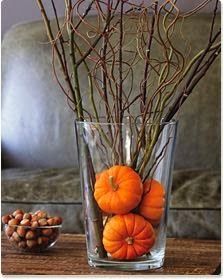 I can even do this one as I have plenty of branches and I can get these little pumpkins from hobby store. 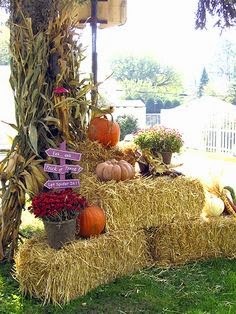 And what is the biggest item to decorate with nature....why it is pumpkins of course and those that can get straw bales also what a great display you can make. So all of you that live where all this is available you can use these items to create a really nice entrance to your home or your front porch. Now me……I pretty much have to stick to spruce boughs, birch, slate colored rocks and glacier mud! :) Oh well….I will just have to look at all the pretty colors.